Throwing on a hat is the best way to cure a bad hair day, and while my bangs grow out I'll be sporting one through the winter. Fedora's and slouchy knit beanie's are both winner's in my book but I have to ask, what's your favorite type of winter hat: A fedora or a knit beanie? 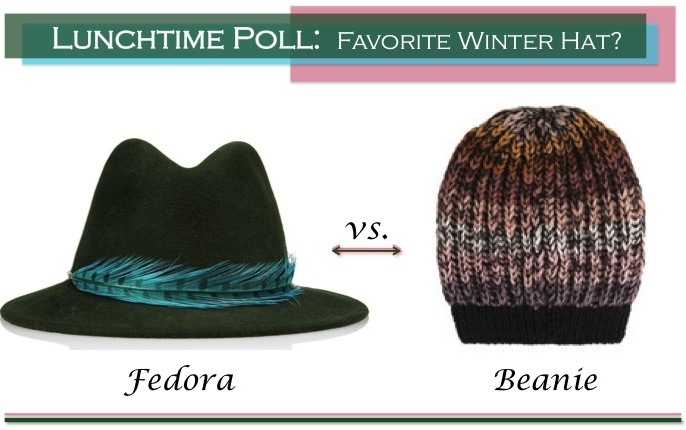 I think for me it honestly depends on the weather – beanies are better for when it's colder, whereas fedoras work in less chilly weather. i think it really depends on what you are wearing, but i generally dig fedoras. they always look so great! I love a good beanie! I love the beanie look - I just can't pull it off! I'm a beanie kind of girl all the way :), but I also have 7 fedoras. I love both! One is super put together and chic, the other is more of a boho chic! I wish I could pull off ANY fall hat...I can't seem to look normal in any style, but I love both that you chose! Both! ;o) because i thinks it totally depends on the outfit. great blog! Fedora!! Beanies mess up my hair entirely too much! Hmm would have to say fedora ! For me, it's a beanie hands down. They are just so warm! Hi Chelsea! Well you'll see I'm more for the Fedora although you can't beat a good beanie! Also depends on the weather here in the UK! Too windy too cold beanie all the way! Hope to hear from you!